The first two episodes (and one was the two-hour preem) made us wait til the last 15 minutes until we got wine. 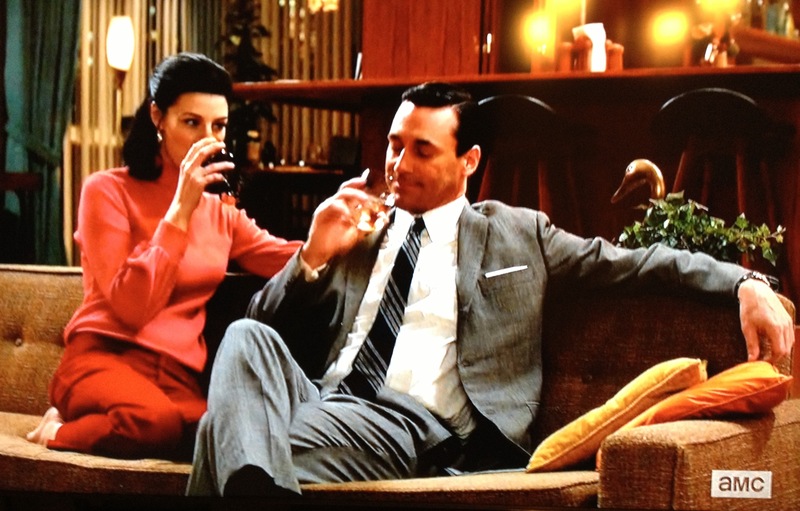 Then in Mad Men‘s whip-you way, we got not just one but two wine scenes in the FIRST 15 minutes! Woo hoo. 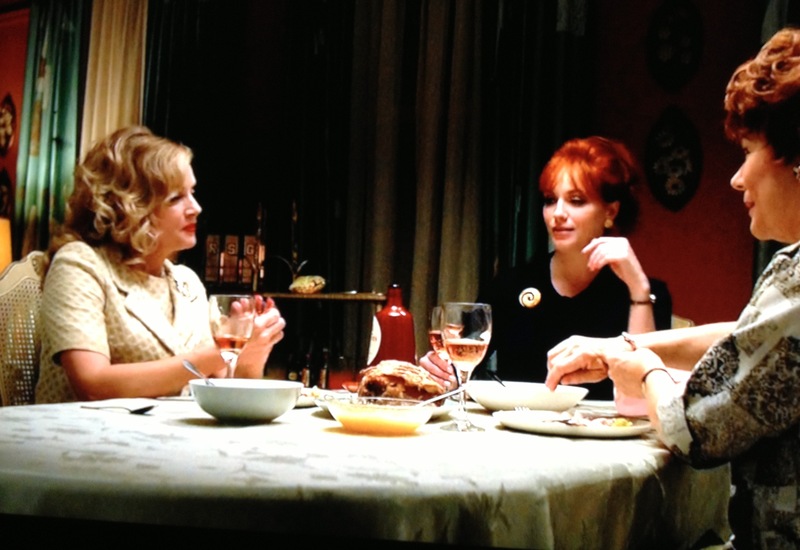 So let’s start with Joan’s dinner, with three glasses of Lancer’s rosé. Lancer’s, a sweet, slightly sparkling Portuguese rosé, used to be a massive seller. And, according to absolutely everyone who’s had it, is pretty terrible. 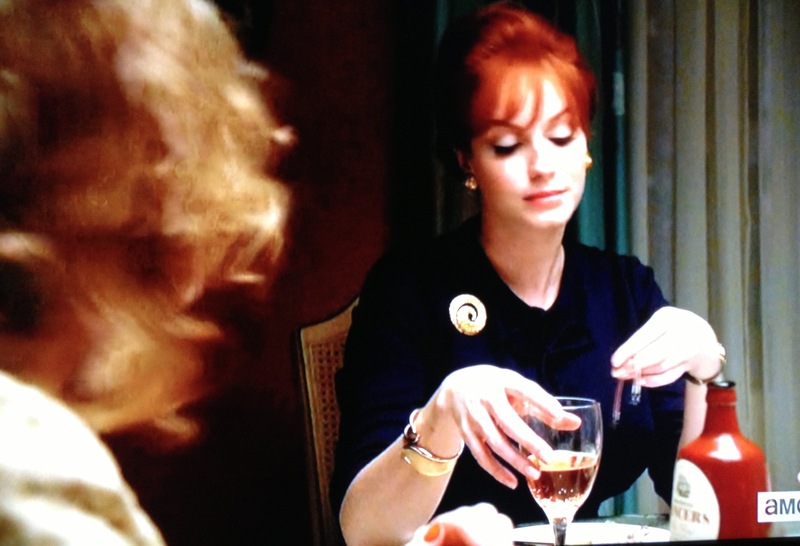 Still, you can’t blame Joan (nor would we want to) – that was like the only rosé option aside from Mateus in the 60’s. 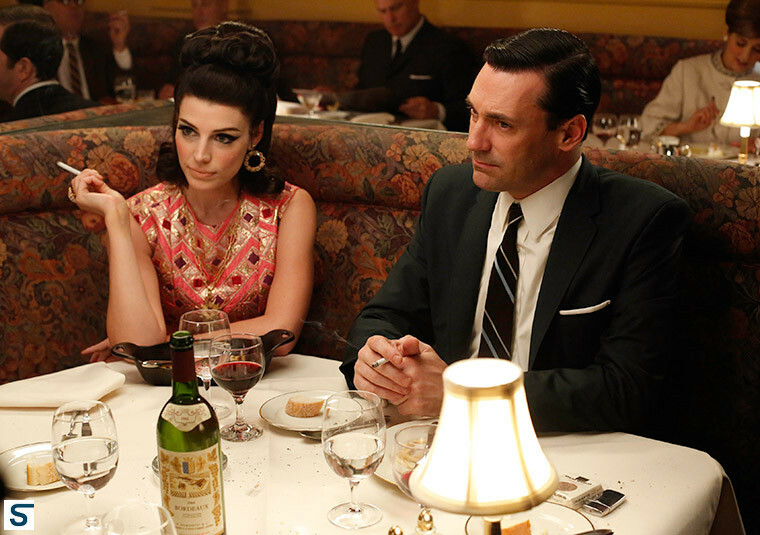 You know in modern life it would be you, Joan, and a few bottles of good rosé every Tuesday after work. Then Megan tried to butter Don up and it totally didn’t work, even though she poured him a drink, promised coq au vin, and had a bottle of wine on the table (pouring herself a glass). Looked like a Bordeaux. Was starting to think that’s all she’s ever drank, but then remembered they all had Burgundy on New year’s and went back to find that she also went Pinot during the Boeuf Bourgignon episode and the spaghetti throwing episode last season. Memory block on my part! Then we were swingin’ (haha, couldn’t resist). 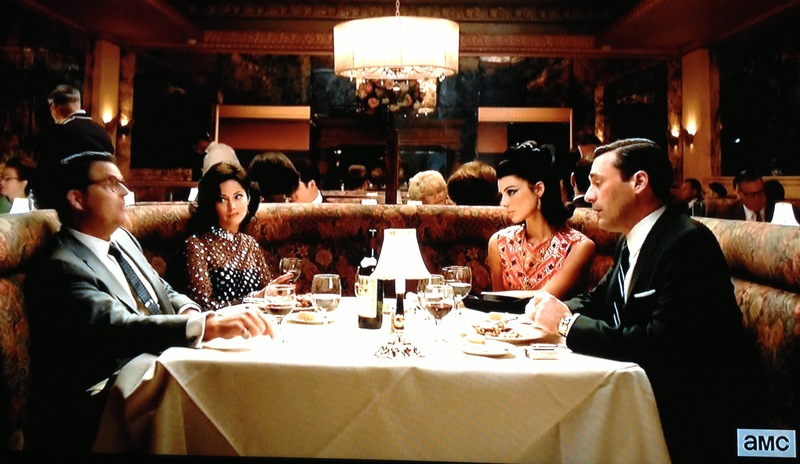 So at dinner with the couple who really liked Don and Megan, they were all – even Don – drinking wine. Couldn’t make out what it was, since they were going to all lengths in the shots to avoid the label (I’m not joking). Thought maybe it was a Bordeaux but I asked my friend at Wine Spectator who covers Bordeaux to see if he could ID the bottle for us and he said he thought the neck label actually looked Italian. But THEN I found a full promo shot online and it’s definitely Bordeaux! OK, so that was it for real wine, and I don’t know if the following should count or not. 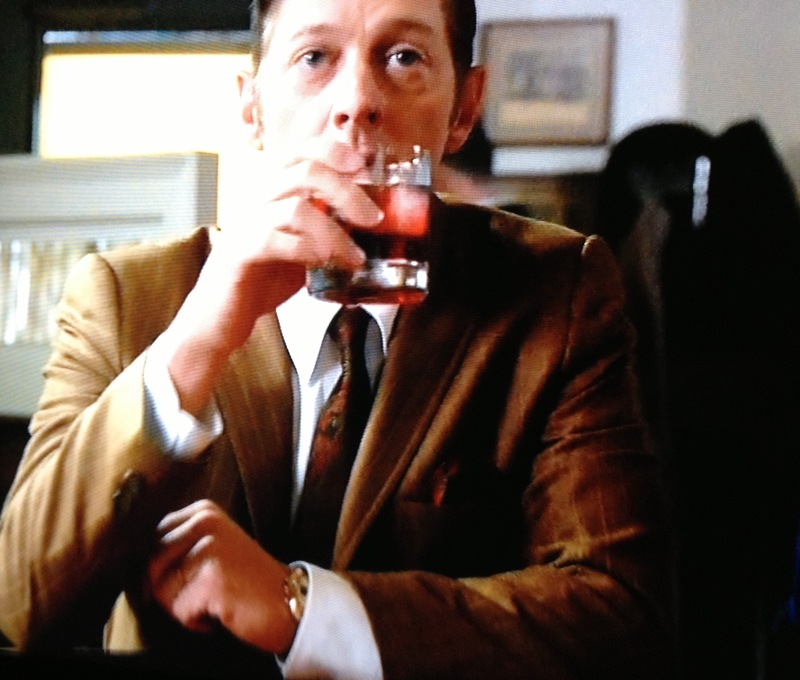 But someone on Twitter pointed out that Teddy Chaough ordered an Old Spanish at the bar, which is some vile drink made of red wine, tonic water and olives. Apparently, this is a drink made up by a 30 Rock writer. Didn’t see any olives in Teddy’s, but who would order red wine and tonic? Barf. Tags: bordeaux, lancer's, mad men, portugual, Rose, wine. Bookmark the permalink. Yeah, I also saw someone else say it was a made-up drink in a 30 Rock recap, but it’s not. Barfy, but real. so if an “old spanish” is a real cocktail from the ’60s why can I find out anything about the drink? hell, I even called the Old King Cole in NYC asking their old-timers about it and no one could nake the associaiton with “rye rocks.” if you have any info it would be appreciated. I googled it and found a few recipes. It didn’t have any association with rye rocks – that was Peggy’s drink and he got the Old Spanish. I wonder if AMC knows you’re not using properly released assets for their show. Just something to consider if you’re going to keep promoting your blog on other people’s sites. The drink was RYE ROCKS & AND OLD SPANISH. WHISKEY. Not WINE!! That’s why there were no olives. Left that behind decades ago. It was pretty, though.